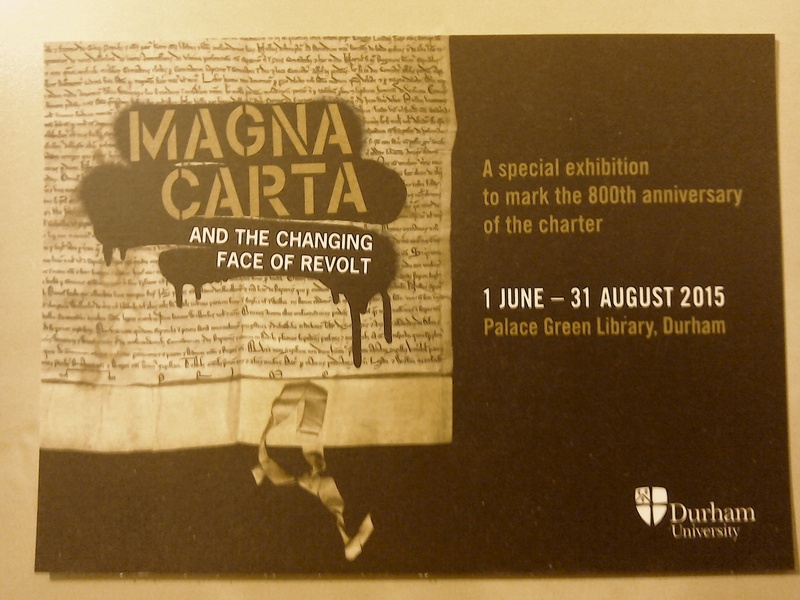 Durham is the owner of the only surviving 1216 engrossment and until 31 August presented an exhibition entitled Magna Carta and the Changing Face of Revolt at Palace Green Library near the Cathedral itself. (Another 1216 copy made for Prince Louis, later Louis VIII of France, survives in the Archives Nationales in France, but this is not an engrossment.) For each half-hour slot 35 tickets were available at £7.50 each. Despite this there was a wait on arrival, and it became apparent that the warders were operating a ‘one-out, one-in’ policy, so we had to queue in an ante-room which was not really meant for holding a dozen people at once. Not the most gruntling of starts – and it didn’t really take account of visitor behaviour at exhibitions either. People cluster around the first few exhibits and then thin out as their attention span wanes. So it was a great idea to release four animals, sorry, visitors, into the pen to look at the first exhibit – which of course was the key exhibit, the 1216 engrossment! Not! Placing your key exhibit first sets it up to eclipse the remainder of the display, and Durham’s ‘supporting cast’ of the 1225 and 1300 reissues were rather glossed over. The wall display text explained that Durham also held these copies, but they were difficult to correlate to the objects in the cases, because of poor captioning. As a medievalist in a former life, I was able to work them out, but had to explain to my husband that the ‘Manuscript c.1400’ preserved in a later hand a 1225 copy (examples of such later copies have also been present at other exhibitions, e.g. the Society of Antiquaries), and the ‘Articuli super Cartas’ of 1300, a document folded over so the text could not be seen (too fragile) was a reissue with accompanying contemporary commentary. 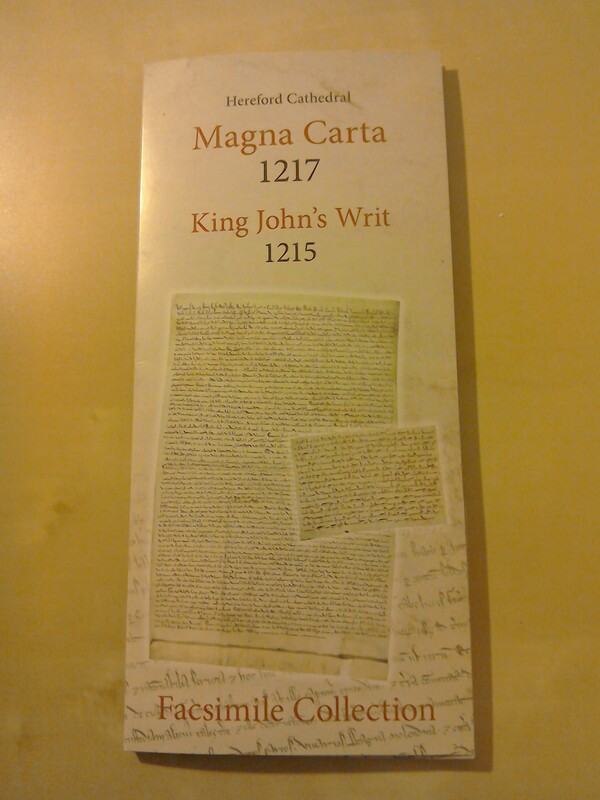 Neither was signposted with text such as: ‘the second copy of Magna Carta in Durham’ etc., so both were missed opportunities to showcase the range of Durham’s Magna Carta holdings. As the Society of Antiquaries show explained, the story of how earlier versions can be recognised in much later physical documents is interesting in itself. The ‘Articuli super Cartas’ was also a stage in the evolution of the Magna Carta, showing that it attracted scholarly interpretation as a living document quite early on. None of this was brought out whatsoever, nor was it explained how the 1216 version was recognised for what it was (although we did learn that Edward I enforced the reading of Magna Carta in the courts). If I had issues with the content, my husband found the display captions – set at angles in the climate- and light-controlled cabinets – difficult to read. Also of interest was a document issued by John to nearby Finchale Priory, with his seal affixed. What role did the North play in the events of 1215 and later, and what was John’s relationship with the church like, since the church was such a key issue of his reign? We were not told, in Durham’s haste to tell the story they had framed, the story of Magna Carta as an inspiration for later acts of rebellion. We jumped forward to the Peasants’ Revolt, the Wars of the Roses, the Civil War, the Jacobite Risings, and the Reform Act. (This story was also told at the British Library, but framed in terms of the evolution of key legal principles.) We came out of the main exhibition room to be ushered into another, this time telling the story of the Catholic recusancy in the north, another form of rebellion. Instead of being ‘tacked on’ to the Magna Carta, it could have been delivered as an exhibition in its own right: its display in a physically separate room obscured its thematic relationship to the main exhibition. In short, I felt that the exhibition was conceived with a feeling that ‘piling it high’ for the visitor justified the admission price. How much better would it have been to have curated a smaller show centred around the 13th century documents and provided a greater learning experience? Less is more! At £6 entry to Hereford’s cathedral library exhibition space enables me to compare apples with apples. For that price you see Hereford’s USP, an extant medieval chained library, the famous Mappa Mundi, and any current exhibition of their treasures, in this case their Magna Carta display, Icon of Justice – Pledge of Freedom. The exhibition took as its focus Hereford’s own collection of these key documents, comprising a 1217 copy of the Magna Carta, one of four extant engrossments of that edition, and the unique 1215 King John’s Writ, or ‘covering letter’ sent to each county with the original 1215 documents. The Writ was translated in full next to the original text (Lincoln take note! ), and all the captions were well lit and informative, for example explaining how the 1217 charter differed from the 1215 one (lacking at Durham, above). Additionally, there was a strong ‘supporting cast’ of documents from their own archives, including chained books removed from the library and opened up to help tell the story. Here there was another, later, copy of the 1217 charter which had been written out as an archive copy in a later 13th century cartulary by a particularly painstaking Bishop (there was, apparently, also a similar archive copy of the 1265 reissue in that volume); here collections of contemporary law codes (‘decretals’) from Europe for comparison, including one where a scribe, clearly bored with transcribing such dry material, had enlivened the text with monsters in the margins. That sense of fleshing out the humanity of the past was also represented by texts from the chained library by Stephen Langton, whose appointment as Archbishop of Canterbury was at the heart of much of the conflict between John and the Church, and writs from William Marshal, who served four kings, including John and his son, Henry II. Which brings me to another key aspect of Hereford’s commemorations. The story continued in the Cathedral itself, with visitors directed to the tomb of Giles de Braose, a contemporary Bishop of Hereford whose family’s lands were unjustly seized by John. Pop-up stands around the Cathedral gave a timeline of key Magna Carta events and told visitors something of medieval life – medicine, clothing, and the Church. Finally, beautiful calligraphic banners hanging between the piers of the nave depicted key texts from the Magna Carta in modern English, set in roundels surrounded by key concepts linked with those texts (for example: legal aid underpinning the ancient pledge that no one is to be denied justice). All these displays demonstrated Hereford’s place in the Magna Carta story, made it accessible to younger visitors, and as a free display ensured that no one was economically excluded from the Magna Carta story if they could not visit the Library exhibition. The Library’s entrance fee pricing was a little eccentric: a price list for small, medium and large families (so £14 for 2 adults and 3 children was good value, against a £6 entry fee for a single adult), while concessions were granted to HM Forces (Hereford is, after all, a garrison town) but not to disabled visitors. Included in the entrance fee is access not only to exhibitions but to the core collection, including the famous Mappa Mundi. There was a tactile Mappa Mundi, whose purpose was more to show the undulations in the physical document than to represent the map’s contents. The map itself was in very low relief so seemed a missed opportunity to make the map more accessible for visually impaired visitors. Nor was the video about the Mappa subtitled, so clearly disabled people are not expected to visit! Yet, just as we left, a coach party of senior citizens arrived, and I’m willing to bet some of them might have quite liked subtitles to enhance their enjoyment . . . In short, however, I felt that Hereford’s exhibition really made the most of their documents and their connections with key players in the story, whereas Durham’s effort tried to expand the story beyond their own holdings and was the poorer for it.